Awaken the most complete liquid Vitamin available. At Awaken Nutrition, we’re not a multilevel company or a mass distributor of flavor-of-the-month products. We put our research and advertising dollars where they belong — into the product. At Awaken Nutrition, our goal is simple. We want to produce the best liquid vitamin supplement in the world. We can say, without hesitation, that Awaken liquid vitamin is the best tasting, most effective liquid vitamin available today. ABSORPTION IS KEY: You Are What You Assimilate. Everyone’s heard the old saying, “You are what you eat.” When it comes to vitamin and mineral supplements, it’s really more accurate to say, “You are what you assimilate.” If your body can’t absorb the supplements you take, they obviously can’t do you any good. Maximum absorption is the key to the effective use of any vitamin supplement. But the sad truth is only 10 to 20 percent of solid pill and tablet supplements are actually absorbed by the body. Most supplements in a pill form are cold compressed. This prevents them from breaking down easily and that makes absorption difficult. Don’t Throw Your Money Down the Toilet . . . Solid pills and tablets lose much of their effectiveness as they pass through your digestive system because, chances are, they won’t dissolve completely. So, all those multi-vitamins and minerals you been taking? You’re literally flushing most of them away. But here’s the good news. According to the Physician’s Desk Reference, liquid vitamins like Awaken have an absorption rate up to 98 percent! Why the big difference? Because it’s not a solid, but a liquid, Awaken is processed by the digestive tract much more quickly and efficiently and rapidly absorbed into the bloodstream. Also, minerals generally bond to molecules that are too large to pass through the walls of blood cells. As a result, they are seldom absorbed. On the other hand, all medical doctors know that sugar molecules, especially fructose, are 100 percent absorbed. To solve the absorption problem, Awaken uses a patented process that bonds both vitamins and minerals to fructose molecules. That means that your body will absorb almost 100 percent of the nutrients in Awaken, and you’ll get the most benefit possible from every essential ingredient. Your ability to absorb nutrients from the food you eat, and the supplements you take, depends a great deal on stomach acids and digestive enzymes. As we get older, our bodies produce significantly reduced levels of these important chemicals. As a result, essential vitamins and minerals become “locked up” and can’t be absorbed. The same holds true for anyone of any age whose body can’t produce the necessary levels of digestive acid and enzymes. Once again, it’s not how many nutrients you put into your body, but how much your body tissues can absorb that’s important. Through its liquid deliver system and exclusive molecular bonding process that makes more minerals available for absorption, Awaken is the ideal supplement for older adults and persons with digestive problems. It minimizes the work that must be done by stomach acids and digestive enzymes, and provides the most easily absorbed, most effective nutrition available anywhere. Besides establishing a daily regimen of the specialized liquid supplements from Awaken Nutrition, there are a number of other things you can do help your body absorb the nutrition it needs. Don’t forget the importance of daily exercise. In addition to its many other benefits it also aids in absorption of nutrients. The power of positive thinking is real, and so are the negative effects of chronic stress in our daily lives. So, whenever and wherever possible, implement the former and take steps to reduce the latter. Eat whole, healthy food and take your vitamins and minerals at mealtime or with a snack. Whatever amounts of stomach acids and digestive enzymes you may have, they are always stimulated by eating and will aid in nutrient absorption. Awaken liquid vitamin is the best tasting most effective liquid vitamin available today. 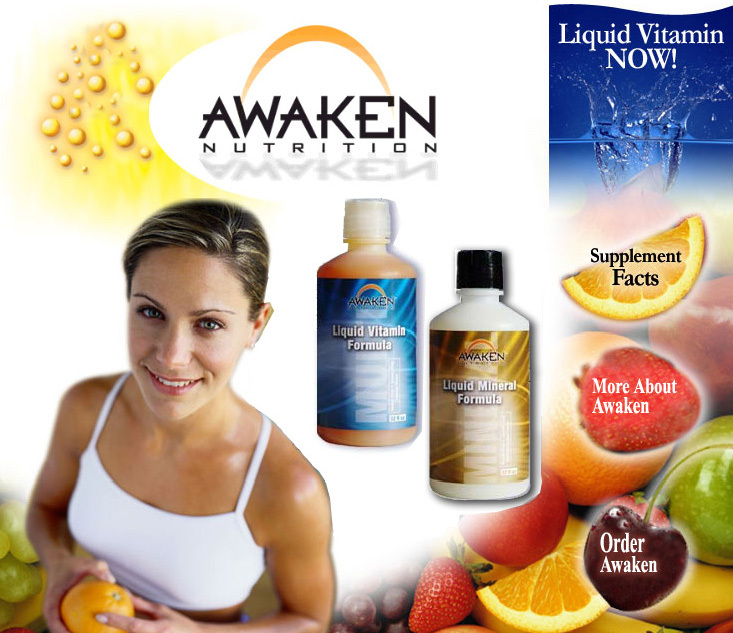 Awaken Nutrition put there research and advertising budget towards development of liquid vitamin. Awaken is not a multi level company or a mass distributor of flavor of the month products. At Awaken our goal is simple to produce the best liquid vitamin supplement in the world. Maximum absorption is the key to effective use of liquid vitamins. The combination of liquid vitamins and minerals are essential. Minerals generally bond to molecules too large to pass through cell walls and consequently are seldom absorbed A liquid vitamin supplement that uses amino acids is the best to enable mineral molecules to absorb. What this means is that the benefit can be derived from every essential ingredient. Liquid vitamin supplements have specific advantages over pills and tablets. Absorption is the key difference. Most supplements in a pill form are cold compressed which means that they do not break down easily. Therefore absorption is difficult. Solid forms lose much of their effectiveness as they pass through the digestive system and may not dissolve completely as they pass through the digestive tract. In Tacoma, Washington, 250,000 pounds of undigested vitamin and mineral pills, some with the brand names still readable, are pulled out of the sewers every six weeks. In Salt Lake City, over 150 gallons of undigested vitamin and mineral pills show up in their filters every month. Liquid vitamin supplements are an effective method of delivering the proper absorption. Liquids work 9 times faster than pills. They bypass the digestive tract and are absorbed into the bloodstream, not to mention what it would also do for our city sewers. Your ability to absorb nutrients from food you eat and the supplements you take may be a problem do to the lack of stomach acid. As we get older our ability to absorb nutrients are more difficult do to the reduced levels of digestive enzymes. Vitamins become “locked up” the keys to release them are digestive enzymes. In older people, this may contribute to lower levels of vitamins B2, B6, and B12 as well as decreased absorption of zinc. It’s not how much you take but how much your body tissues absorb that is important. Liquid vitamin/supplements have a higher level of absorption; more nutrients reach their intended destination. Liquids are also helpful for individuals who have difficulty swallowing pills or capsules. To aid in the absorption process you should also exercise daily, think positively, eat whole healthy food and manage chronic stress in your daily lives. Take vitamins with food when possible. The digestive enzymes are stimulated when eating and aid in nutrient absorption. Use liquid nutritional supplements when possible. They provide the most effective and reliable system for nutrient delivery to the bloodstream.